Custom Flavors is a Gold Sponsor this year. We don’t have our booth number yet, but we’ll share that info on Facebook just as soon as we know. Be sure to come see us! Will you be at Natural Products Expo West this year? Right on the heels of Suppliers Night, we’ll be walking the Expo at the Anaheim Convention Center on March 9-11th. Let us know when we can meet up with you! The office is incredibly busy right now. As we prepare for the upcoming trade shows, we’re also weaving our new logo into all our materials and reworking the website. It’s exciting to see the new vision becoming reality. Find us on Facebook to see all the latest updates. Since 2016, we’ve been able to offer our customers flavors that are certified organic. 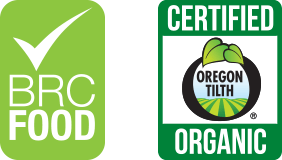 We’re pleased to continue this certification as we support the organic movement in the food industry. Please reach out to create a new certified organic flavor today! You can download the full certificate here.